Leading up to my Tableau Conference presentation, I wanted to put together a series of blog posts that discuss the three pillars of my discussion and approach to self-service analytics. The first pillar is Training. Without a trained set of super users, the Security structure and Governance model you will develop doesn't matter because no one is using it. Self-service analytics means being able to access all the data you need, use a variety of tools to analyze it, and have easy methods by which to share your findings. It is always a work in progress, but as much as possible I try to provide these capabilities to users. New data sets will never cease to exist and current data sets need to be managed and distributed in a scalable way. Most users probably turn to Excel for analysis because it's pretty standard on every enterprise machine, but sharing is not always easy - do you email it, save it to some network drive, or something else entirely? 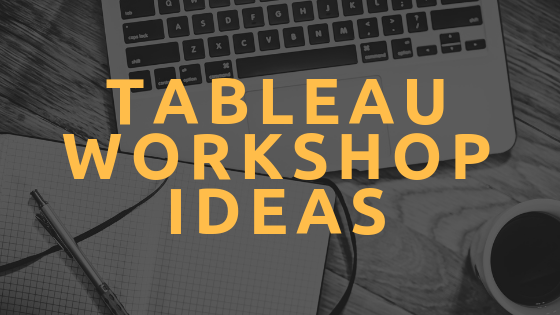 Tableau has a built-in set of functionality that allow for easy sharing, scheduling, and access. This post is all about learning to use Tableau to analyze the data you've got. 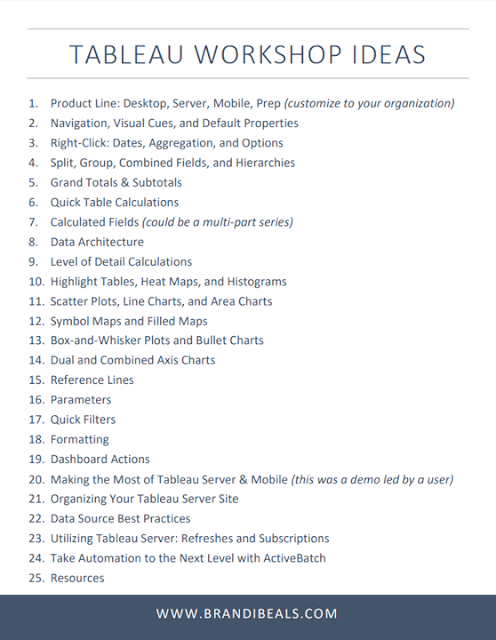 More specifically, this post is about the curriculum we used this year to teach others about Tableau. I embrace self-service because the individuals asking questions about the business probably know the data and what they're looking to answer far better than I do. Why not give them the data, the tool, and allow them to ask and answer their own questions? Ultimately I will save myself some time because I won't have to rework an analysis based on some nuance in the data that wasn't mentioned during requirements gathering, or a change in requirements, or one of many other issues that demand an iterative process. Since taking this approach, users have begun to create their own reports, make changes as necessary, share and use Tableau's native capabilities such as subscriptions, the mobile app, and scheduling data refreshes. Super users have emerged that have helped guide other users as well as the administrators of the technology. An underlying theme in my presentation is initially allowing each pillar to grow organically. Side note: I love to read and am currently working on a book called New Power that has given me a lot of great ideas for developing an active community. At the beginning of the year I sat down with some colleagues to create a list of topics we wanted to cover over the course of the year. We decided to do short (20-30 minute) segments ever other week on a Tuesday morning and have been playing around with the timing and frequency of our workshops to see what suits our users best. The idea here was that most people are able to make time for a 30 minute meeting. Mondays are usually busy for people but we wanted the content to be as early as possible in the week so users had a chance to use their new knowledge. One of the challenges we are facing is that our user base are at a variety of skill levels. The hope was that our list of workshop ideas would gradually build on each other yet still provide value to all.